Based in a futuristic world that was nearly eradicated by a virus that killed off 99% of the human population, five million survivors remain in Bregna, the last city on Earth, after being cured by a scientist named Trevor Goodchild, whose family ruled for 400 years. Bregna is said to be the height of human civilization, the perfect society, but there are those in the society who know there is more to it then what is perceived. Freedom is something that is almost non-existent in Bregna. The people are manipulated by fear, and the government silently does whatever they want. Rebels, however, refuse to give up their freedom and constantly battle to overthrow the government. They are inspired by the many disappearances of citizens. They are known as the "Monicans". We follow Aeon Flux, a deadly but beautiful assassin haunted by her past who happens to be one of these rebel Monicans. Her constant plight to pick apart and destroy the government of Bregna is evident, and she will stop at nothing to accomplish her goal. Her ability to fight against the odds using acrobatics, weapons, martial arts, and speed makes her almost unstoppable. Aeon Flux is a highly violent, intriguing, and strange series that may certainly go against the moral standards of some. Between the peculiar sexual occurrences and the skimpily dressed main character, it is hard to say this is a series that is directed at children. That being said, the controversial adult animated series is one that will capture the hearts of many men, and, maybe even some women. It is unique and somewhat "kiddy" in a sense of it's artistic appearance and musical interpretation, but concisive in a sense of what it is truly about; blood, violence, and politics. While I wouldn't turn your kids on to this one, it is definitely a series that is interesting and would definitely attract adults who enjoy their occasional violent animated series. This is a solid show and will keep you at the edge of your seat as the events occur throughout. Aeon chases Trevor into the future and, a thousand years later, they are finally alone together. Aeon is on the trail of the ill-mannered criminal brute Bambara, and she fears she has been implanted with a behavior-modification program designed by Trevor. Trevor's experiments in artificial life forms are contained in an ecosystem called the Habitat. An ocean of paralytic fluid protects it from the intrusion of outside influences. Aeon's battle against Trevor is overshadowed by a threat to both of them from a mysterious and ancient evil force. Aeon must undo the effects of a successful mission when she learns that its accomplishment is harming an innocent victim. Aeon Flux and the Monican resistance force have captured the Demiurge, a powerful god-like being, and prepare to send it into space to rid the Earth of its influence. The Breens, led by Trevor Goodchild, battle to prevent the launch? In cloning Aeon, Trevor discovers she is more than just her physical parts. Aeon and Trevor engage in a contest of wills over the fate of a pair of lovers separated by the heavily armed border between the nations of Bregna and Monica. Trevor Goodchild's latest obsession is a female exquisite being which he keeps locked away in a secret chamber. Will Aeon foil Trevor's plans once again? Leather-bound and lethal, Aeon Flux ? secret agent, saboteur ? engages in a never-ending battle of wills with her nemesis/love, Trevor Goodchild. And what she may lack in morals and warmth, she more than makes up for with cat-like reflexes and ammunition. This director?s cut of the groundbreaking MTV series is a mind-blowing combination of killer comic-book style animation, complex plots and themes, and action-driven narrative. Aeon Flux doesn't skate the edge, she is the edge. And she will prevail, even if it kills her. Over and over again. Leather-bound and lethal, Aeon Flux - secret agent, saboteur - engages in a never-ending battle of wills with her nemesis/love, Trevor Goodchild. And what she may lack in morals and warmth, she more than makes up for with cat-like reflexes and ammunition. This director?s cut of the groundbreaking MTV series is a mind-blowing combination of killer comic-book style animation, complex plots and themes, and action-driven narrative. Aeon Flux doesn't skate the edge, she is the edge. And she will prevail, even if it kills her. Over and over again. Aeon Flux is currently available to watch and stream on MTV. 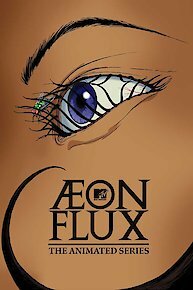 You can also buy, rent Aeon Flux on demand at Amazon, MTV, Google Play, iTunes online.